You can’t rely on the global CO2 data. Ice cores are inaccurate, and modern instruments are often placed near volcanoes. From Hawaii to Antarctica, data collected from all over the world tell us one thing: Carbon pollution is going up. Mauna Loa is often used as an example of rising carbon dioxide levels because it’s the longest continuous series of directly measured atmospheric CO2. The reason it's acceptable to use Mauna Loa as a proxy for global CO2 levels is because CO2 mixes well throughout the atmosphere. Consequently, the trend in Mauna Loa CO2 is statistically indistinguishable from the trend in global CO2 levels (Figure 2). 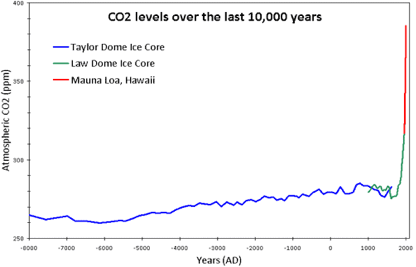 If global CO2 was used in Figure 1 above, the resulting "hockey stick" shape would be identical. 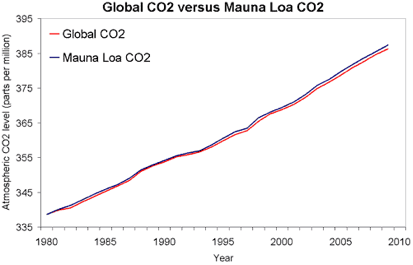 Figure 2: Global atmospheric CO2 versus Mauna Loa CO2 (NOAA data). © John Cook.